United States President elect Donald Trump’s victory may not have impressed many Kenyans but to one family in Kisumu, the billionaires win was a blessing in disguise.Mr Felix Otieno and his wife Lorna Akoth could not hide their bliss following Mr Trump’s victory.The couple had defied all odds and criticisms in August and named their third born son Donald Trump Otieno following what they said was based on the president-elect’s principles. In an interview with Nation in Kisumu on Thursday, Mr Otieno said the decision was influenced by Mr Trump’s “open mind” that saw him make controversial statements regardless of his audience. “He spoke his mind deep from his heart. 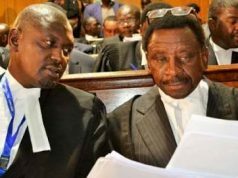 Most politicians are not sincere like him,” Mr Otieno says. “I admired Mr Trump because he is a man who says what he thinks and thinks what he says. I love people who speak the truth without any fears,” he added. Ms Akoth says Mr Trump stood his ground on controversial policies despite criticisms. “He was frank and firm. At least he spoke the truth without using propaganda or lies to win votes. We loved him and had to name our son after him,” she says. 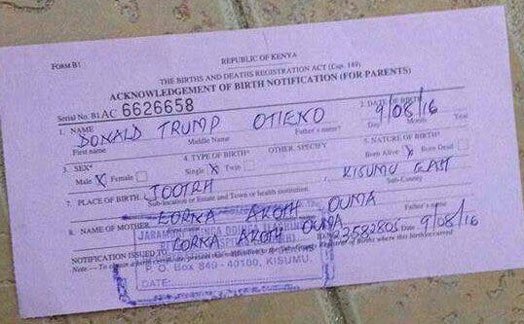 A spot check at the Jaramogi hospital’s maternity wards on Thursday revealed gloomy mothers who had just given birth on Tuesday when Mr Trump pulled the shocker win. 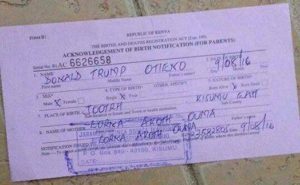 The facility’s health records and information officer Dr Tom Morike said a total of 18 babies were born at the hospital on Wednesday – 15 male and 3 females but none was named after Mr Trump. A mother, who only identified herself as Ms Christine, said: “We don’t like Trump so we cannot name our kids (babies) after him. At least for Hillary Clinton, we would be happy to name our babies after her. RAILA SENDS STERN WARNING TO US PRESIDENT DONALD TRUMP!! Previous articleRAILA SENDS STERN WARNING TO US PRESIDENT DONALD TRUMP! !